A changemaker is someone who makes a personal decision for their lives to be a part of the solution...part of the fight for a better world. there is one main difference between changemakers and the rest of the world. Most people desire change; many know what they would like to see different in the world, and some even know how it could be done best. But Kofi Annan belonged to that higher class of people who act to see their change happen. His aristocratic style, cool-tempered elegance and political savvy helped guide his ascent to become the first black African UN secretary-general, and the first to be selected from the ranks of the global agency staff. And while the world is shocked after the death of the former first black African UN Secretary Kofi Annan, I want to recall his legacy as a great African leader, changemaker and peacemaker. "Kofi Annan was a guiding force for good," current U.N. Secretary-General Antonio Guterres said. In many ways, Kofi Annan was the United Nations. He was chief architect of what became known as the Millennium Development Goals, and played a central role in creating the Global Fund to Fight AIDS, Tuberculosis and Malaria and the U.N.'s first counter-terrorism strategy. He rose through the ranks to lead the organization into the new millennium with matchless dignity and determination. But it doesn't stop there. Changemakers are relentless. "A diplomat extraordinaire, we will remember Mr Kofi Annan for his commitment, his leadership and his tireless efforts to advance the African agenda" President Ramaphosa. In fact, Kofi Annan is worldly recognized for its relentless efforts in pushing for peace as the most paramount instrument for sustainable development when others were structuring war. He was a master mediator who was keen on flying the flag for peace around the world, always looking for reconciliation when others were looking for division. From March 1993 to February 1994, he served as assistant secretary-general for Peacekeeping Operations. In 2001, he and the United Nations were jointly awarded the Nobel Prize for Peace. Just before becoming secretary-general, Annan served as special envoy to the former Yugoslavia, where he oversaw a transition in Bosnia from U.N. protective forces to NATO-led troops. In 2005, he succeeded in establishing the Peacebuilding Commission and the Human Rights Council. In 2006, he helped secure a truce between Israel and Hezbollah. And when he departed from the UN, he left behind a global organization far more aggressively engaged in peacekeeping and fighting poverty, setting the framework for the U.N.'s 21st-century response to mass atrocities and its emphasis on human rights and development. After leaving his high-profile U.N. perch, Annan didn't rest. In 2007, he founds the Kofi Annan Foundation, a non-profit promoting global sustainable development, peace and security. That year he helped broker peace in Kenya, where election violence had killed over 1,000 people.
" His quiet advice on how best to defuse impending crises was in constant demand from all corners of the globe, in particular from Africa," said former Norwegian Prime Minister Gro Harlem Brundtland. As special envoy to Syria in 2012, Annan won international backing for a six-point plan for peace. In 2017, his foundation's biggest projects included promotion of fair, peaceful elections. They also mobilize leaders of all sectors to provide leadership where it needed. The Foundation works on the premise that there can be no long-term peace without development and no sustainable development without peace. And no society can long remain prosperous without the rule of law and respect for human rights. 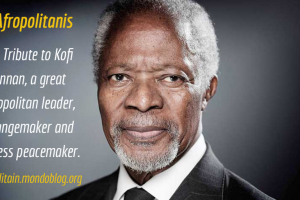 Annan has been described as "Africa's foremost son " or "a tall iroko tree" whose achievement as the first black African to lead the UN is a source of pride to many on the continent.
" Wherever there was suffering or need, he reached out and touched many people with his deep compassion and empathy " said His foundation when announcing his death in Switzerland on Saturday in a tweet. He was there for Africa during the Rwandan Genocide. In 1998, he helped ease a transition to civilian rule in Nigeria. He brokered a crucial truce in the bloody aftermath of the Kenyan election violence in 2007/2008. Around 600 people were killed after marauding youths armed with spears, bows, arrows and machetes destroyed homes around the town of Eldoret, near the border with Uganda. Annan and his team got both leaders to agree to a power-sharing coalition that ended the bloodshed. One Twitter user wrote on hearing of his death Saturday: " Were it not for you, our country would have been brought down to ashes. " He mediated a settlement of a dispute between Cameroon and Nigeria over the Bakassi peninsula. "He stood by The Gambian people during difficult times in 2016/17," Gambian president Adama Barrow said on twitter. 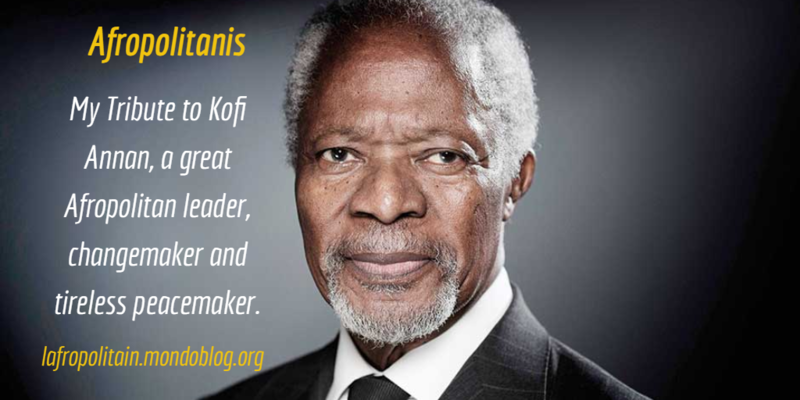 Annan was widely recognized as one who advanced the African agenda greatly during his tenure at the United Nations. Many have lauded his significant contributions to the humanitarian and development issues in Africa, not just through the United Nations but through his work at the Mo Ibrahim Foundation and the Africa Progress Panel, which advocates at the highest level for equitable and sustainable development in Africa. He launched a global campaign at an African leaders summit in 2001 calling for fresh funding to tackle the HIV/AIDS epidemic ravaging major countries in sub-Saharan Africa. A year earlier, he had called on world leaders at a UN Security Council meeting to urgently prioritize the AIDS epidemic, which he said was 10 times deadlier than armed conflict on the continent. He will be remembered for his remarkable achievements in ensuring and contributing to the stability of democratic governments across Africa. But also as a Pan-Africanist leader and extraordinaire diplomat genuinely committed to serve the world. He was humanity's best example of human decency and grace. In a world now filled with leaders who are anything but that, our loss, the world's loss becomes even more painful. Taking the leadership rope today as the young Generation of Africa, I see difficult days ahead. However, I shall take lessons from history, inspiration from him and try to do a better job. Je suis un afropolitain indiscipliné et passionné par l'éducation, le numérique et le feminisme.